A few weeks ago I arrived home from Mighty Summit with my heart full of admiration for the talented women I connected with on the trip, and my head and notebook full of inspiration resulting from conversation and reflection time. 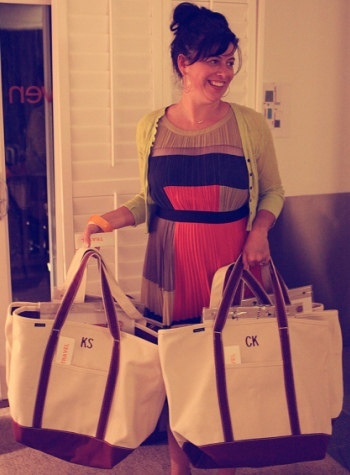 I also returned with lovely accessories -- some of which I've been wearing, well, pretty much constantly. I wanted to share them here because they are awesome and I think you will love them too. 1. Bizarrely, I have no vibrant blues in my closet, so when given the opportunity to pick a pair of Tieks I chose electric blue. And who would have imagined: they go. with. everything. 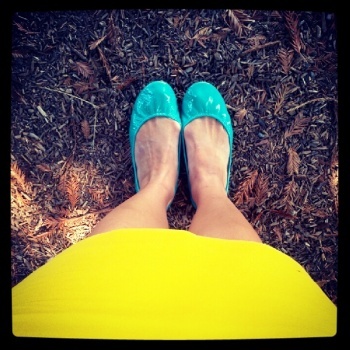 In California, I wore my Tieks with a chartreuse pencil skirt (shown) as well as an almost all white ensemble. Since returning home I've worn them almost every day; they're perfect with skinny jeans. 2. 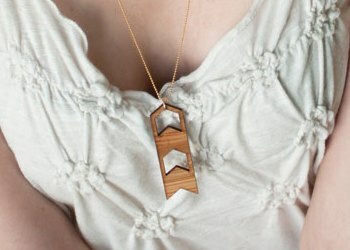 I'm usually into gems and metals when it comes to jewelry but this bamboo chevron necklace by Feisty Elle? Makes me feel like the ultimate eco-friendly hipster. This is another great accessory because it goes with practically everything; I especially like it paired with a lace trimmed tank, skinny jeans, bright belt, and, yeah, my Tieks. 3. I tend to go for bold jewelry since my clothes tend towards neutral, but my roommate Stephanie had me rethinking that equation -- she wore a lot of beautiful minimal pieces. 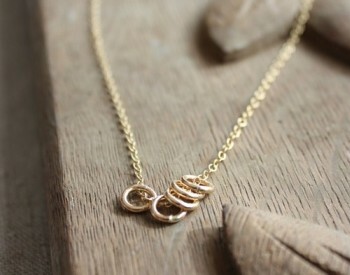 This quintet necklace by Lemonade Handmade was of a similar vein. And I love wearing it because the five rings remind me of the five goals I set while at Mighty Summit.